The CHAs 3rd Biennial Conference held in Bagamoyo, Tanzania in January 2007 established the Africa CHAs Platform Secretariat through the “Declaration of Commitment”. ACHAP was requested to develop a Concept Paper to set up the Platform Secretariat which was to be hosted at CHAK Secretariat in Nairobi. The Platform Secretariat was established in May 2007 with financial support from WCC and DIFEAM. In order to ensure sustained ownership, participation, transparency and accountability that would enrich the work of the Secretariat in serving the Platform objectives and aspirations, a governance structure was developed that would enhance participation in programs and decision making. 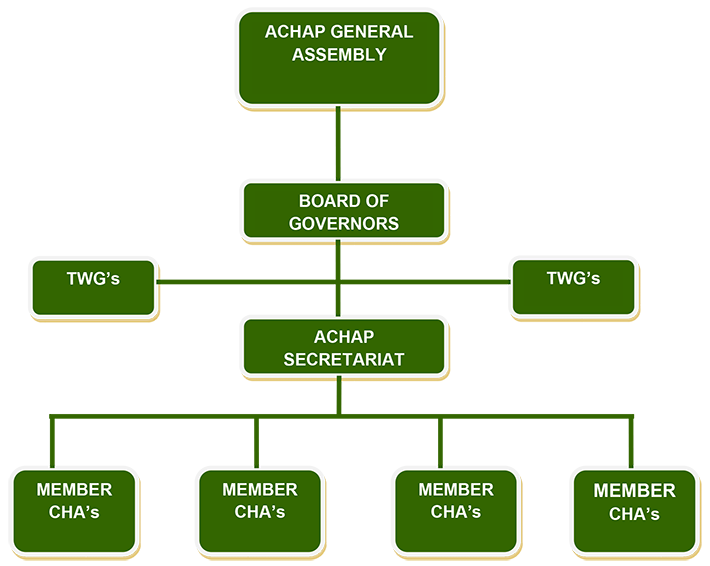 The Governance structure has been further enhanced through the decisions of the 4th and 5th ACHAP General Assembly and the adoption of a new Constitution in October in 2011. General Assembly – that comprises all ACHAP members which should meet biennially to provide overall policy direction and elect the Board members. ACHAP Board – made of 5 members representing the CHAs from 4 regions of Africa who are elected by the General Assembly. The Board is responsible for policy formulation, fundraising, approval of work plans & budget, approval of secretariat staffing establishment, appointment of external auditors, review of programmatic and financial performance and planning for the ACHAP Conference and General Assembly. ACHAP Secretariat – located in Nairobi, Kenya, the Secretariat is responsible for the day-to-day operations of ACHAP, communication and maintenance of the membership directory.